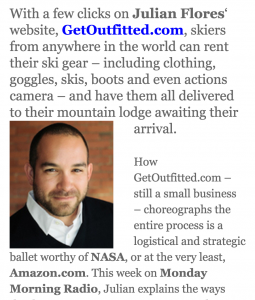 Congratulations to our Client Get Outfitted for their feature on Monday Morning Radio! Are you getting ready to hit the slopes?Â For yourÂ upcomingÂ snow adventure, forget the stores and don’t worry about bothering friends to borrow ski gear. Simply click on GetOutfitted.com and pick exactly whatÂ you need. AtÂ GetOufitted.com you can browse throughÂ hundreds of options from base layers to goggles, all from top brands. Order what youÂ need, and then mark if it’s a 3, 5 or 10 day rental. The order will arrive on the date requested. Simply open it up, ride in style, and when done, stuff it all back into the prepaid shipping envelope. Easy, right?! For as little as $23.00 a day, youÂ can be outfitted in brands such as Burton, Patagonia, DaKine and Garmin, in product which just hit the shelves, ensuring the most up-to-date styles and technology. Make your trip even easier byÂ marking the hotel or condo you’llÂ be staying at, and have your gear delivered there! When done, simply place it in the prepaid mailing bag that comes with every package and drop it at the front deskÂ or a USPS mailbox. GetOutfitted will clean and inspect every item for the next user. Shipping an exquisite rental experience. Rent it, Rock it, Return it. Check them out at getoutfitted.com!